African American girls have a tougher time trying to get through school than any other race, so says a new article on education in America. A Huffington Post article by Rebecca Klein contends that black girls are mistreated more by the school system and benefit less from school than others. Klein shows several disheartening graphs of national statistics that say black girls are at the bottom of the class where it concerns achievement and are far more likely to suffer abuse or punishments. Black girls are more apt to be sexually assaulted, are treated with harsher punishments for behavioral infractions, are referred to the cops quicker and for lesser infractions, get lower grades, and are enrolled in fewer math and science courses than whites, Asians, or others, Klein says. But are they? How was this assumption arrived at? What is it based on? Despite their lower grades, their lack of participation in extra curricular activities, and their lower enrollment in the more difficult subjects, this seems to show that “self esteem” is high, but actual achievement is low. The piece does barely hint at a problem with the national statistics that are citied, however. “African-American boys and girls still disproportionately attend high poverty, racially isolated schools,” the NWLC vice president said. This would seem to be a key issue that the national statistics don’t take into account. If the bulk of black girls in America go to schools in troubled and often failing inner city schools, what effect does that have on the central thesis that black girls are treated worse by schools? 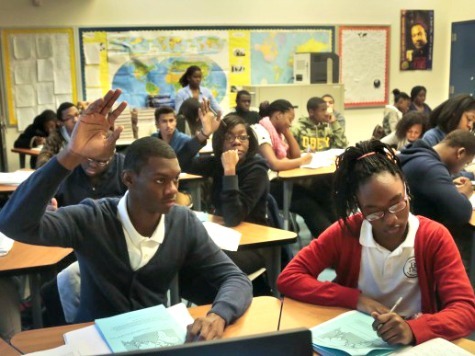 Is this problem in education because the girls are black, or that the schools most black girls attend are massive failures in our Democrat-controlled inner cities? Also, how much does the gangster-rap, anti-education black culture in the inner city effect these numbers? Further, one wonders how the statistics might be changed if inner city schools were excluded from the test samples? Would black girls in schools other than inner city schools still be saddled with the dismal statistics cited in the HuffPost article? Ultimately, there are far too many questions about why African American girls have such a tough time in school than can be answered by the mere statistics presented as prima facia “truth” in the article.